The second illustration for August 1836 involves a byelection somewhere in Essex — Bury St. Edmunds (near Norwich, mentioned at the opening of the chapter) has been nominated as the original of "Eatanswill," although as a young short-hand reporter Dickens had covered just such an election in 1834 at Sudbury (Collins and Guiliano 123). The patriotic Pickwick takes the side of Mr. Pott, editor of The Gazette and the Blues (Tories), whose candidate is the Honourable Samuel Slumkey — of whom Pickwick had not even heard until arriving that morning by coach. He takes as his governing principle in such matters "It's always best on these occasions to do what the mob do"; certainly, such a principle is the most expedient. Ironically, Dickens himself was a "Buff," that is, a Liberal adherent, and so he frames his protagonist as a supporter of the status quo and the opponent of social and electoral change, the issue in the great election of 1832 being extension of the franchise. Expediency, in terms of acquiring rooms for the night, prompts Pickwick to announce himself as an adherent of Slumkey, whose agent is none other than the lawyer Perker whom he had met at the White Hart. How or by what means it became mixed up with the other procession, and how it was ever extricated from the confusion consequent thereupon, is more than we can undertake to describe, inasmuch as Mr. Pickwick’s hat was knocked over his eyes, nose, and mouth, by one poke of a Buff flag-staff, very early in the proceedings. He describes himself as being surrounded on every side, when he could catch a glimpse of the scene, by angry and ferocious countenances, by a vast cloud of dust, and by a dense crowd of combatants. He represents himself as being forced from the carriage by some unseen power, and being personally engaged in a pugilistic encounter; but with whom, or how, or why, he is wholly unable to state. He then felt himself forced up some wooden steps by the persons from behind; and on removing his hat, found himself surrounded by his friends, in the very front of the left hand side of the hustings. The right was reserved for the Buff party, and the centre for the mayor and his officers; one of whom — the fat crier of Eatanswill — was ringing an enormous bell, by way of commanding silence, while Mr. Horatio Fizkin, and the Honourable Samuel Slumkey, with their hands upon their hearts, were bowing with the utmost affability to the troubled sea of heads that inundated the open space in front; and from whence arose a storm of groans, and shouts, and yells, and hootings, that would have done honour to an earthquake. 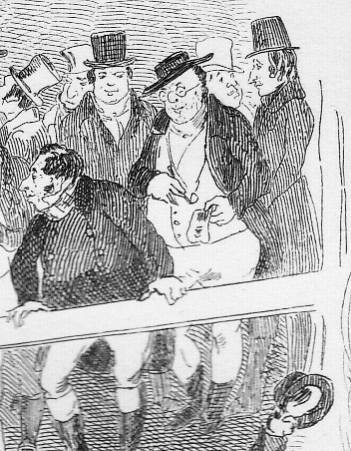 In the illustration, we find Mr. Pickwick easily (flanked by Winkle and Snodgrass, right), but struggle to identify Mr. Pott ("a tall, thin man, with a sandy-coloured head inclined to baldness . . . dressed in a long brown surtout, with a black cloth waistcoat, and drab trousers"), a distinguished member of the fourth estate carrying a double eye-glass. The only logical figure is the balding man in the lighter coat to the left of Pickwick. 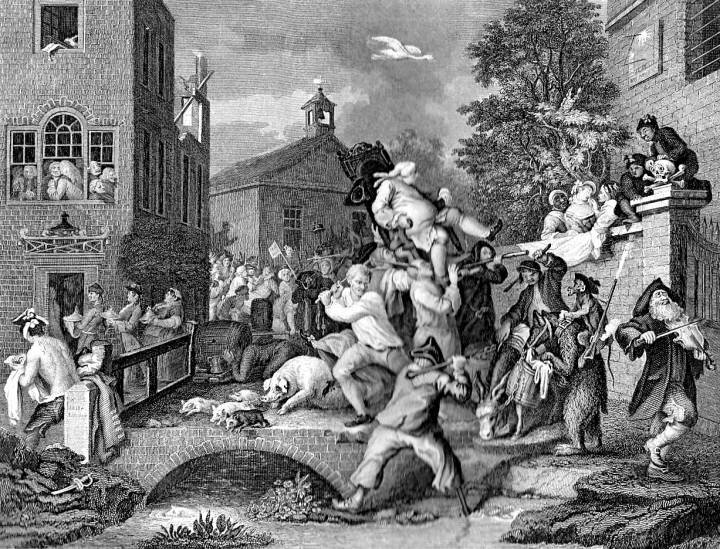 The third and fourth parts of Hogarth's The Election. Click on images to enlarge them and obtain more information. The whole scene is reminiscent of The Election (Part 3. "The Polling," and Part 4. 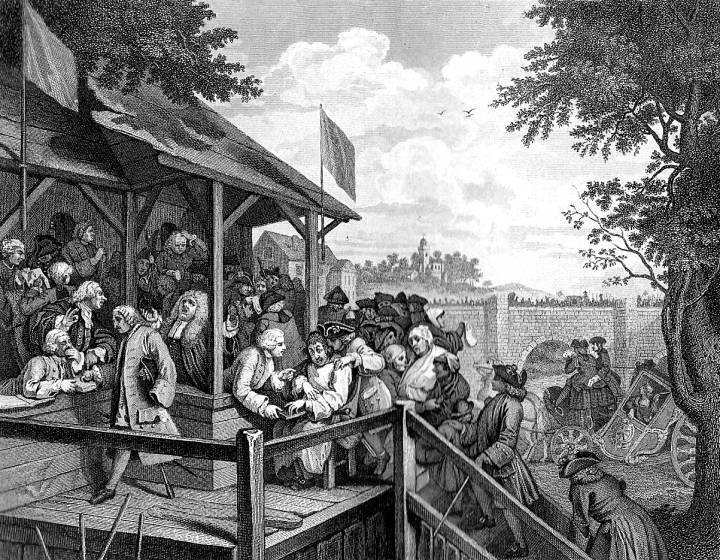 "Chairing the Member") by William Hogarth, from whom Phiz often drew inspiration. 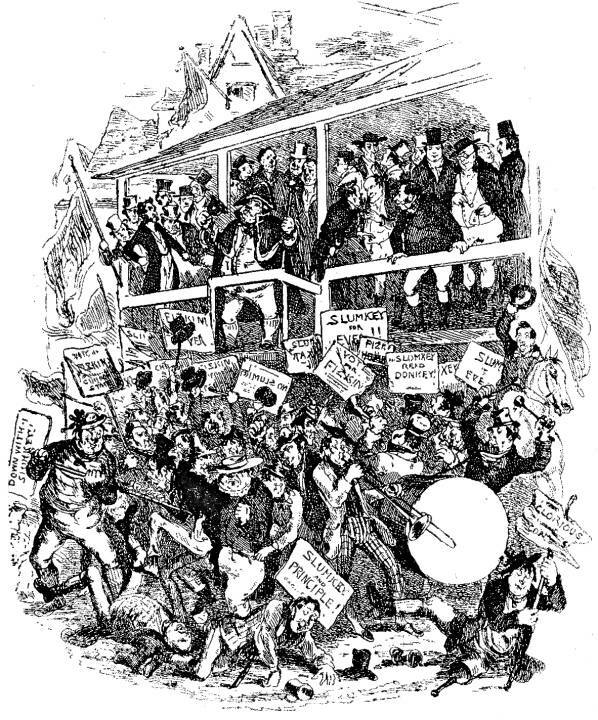 In a hundred years, British parliamentary democracy has only inched forward, so that, according to Dickens and Phiz, an election is still characterised by empty rhetoric and conflicting mobs supporting the Buffs (Whigs) and Blues (Tories); however, the absolute veniality and violence that one sees in Hogarth's series is absent in Phiz's "Election at Eatanswill." The scene in each, however, is equally chaotic. A typical Phizzian touch is the presence of conflicting placards that proclaim, on the one hand, "Slumkey and Principle!" but on the other announce "For Slumkey read Donkey." One ruffian brandishes his placard (bearing the notation "Down with Slumkey") as a weapon, poking one of Slumkey's supporters in the stomach (left), and three other Slumkey supporters lie on the ground, the one in the centre attempting to recover his tankard. 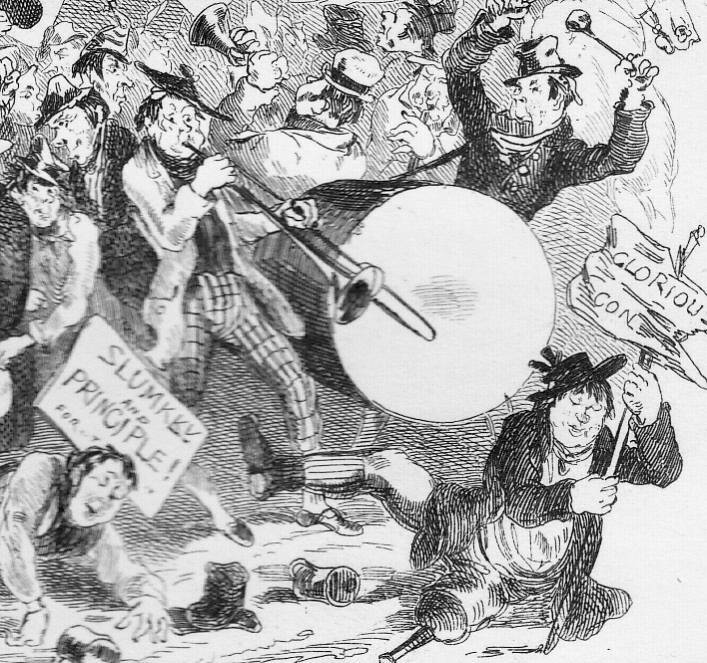 Thus, while a certain measure of discipline exists above, on the hustings, the scene below is a melee of conflicting signs, cacophonous discord (note the trombone-player and drummer as representatives of Slumkey's band), and mayhem. 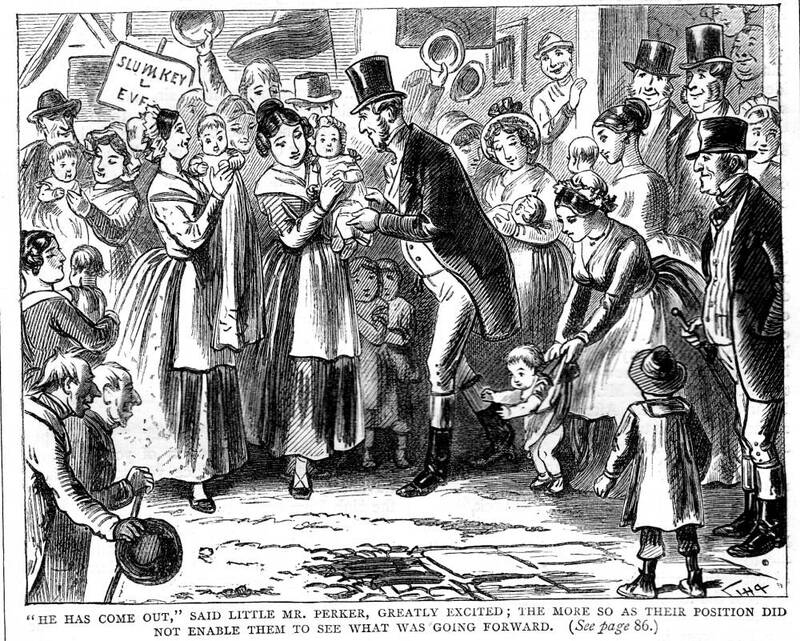 Phiz's illustration thus captures the essence of Dickens's parallel present participles, ""struggling, and pushing, and fighting" among a crowd difficult to calculate in number (Dickens gives the figure 250, but clearly there are not that many conflicting adherents in the plate). Above, the mayor (extreme left) gives commands and the rotund town crier rings his bell, but significantly Phiz depicts not one of the twelve constables whom the mayor has ordered to seize the ringleaders. The candidates themselves, Slumkey and Fizkin, must be two of the three figures between Pickwick (right) and the crier (centre). The exercise of the democratic franchise seems in Phiz's illustration to be a mere pretence for an outburst of mindless mob violence. Left: Phiz's 1873 plate: He has come put . . . . Right: Thomas Nast's He's kissing 'em all!. Click on images to enlarge them. ‘Nothing has been left undone, my dear sir — nothing whatever. There are twenty washed men at the street door for you to shake hands with; and six children in arms that you’re to pat on the head, and inquire the age of; be particular about the children, my dear sir — it has always a great effect, that sort of thing." "I’ll take care," said the Honourable Samuel Slumkey. "And, perhaps, my dear Sir," said the cautious little man, ‘perhaps if you could — I don’t mean to say it’s indispensable — but if you could manage to kiss one of 'em, it would produce a very great impression on the crowd." "Arrange the procession," cried the twenty committee-men. Amidst the cheers of the assembled throng, the band, and the constables, and the committee-men, and the voters, and the horsemen, and the carriages, took their places — each of the two-horse vehicles being closely packed with as many gentlemen as could manage to stand upright in it; and that assigned to Mr. Perker, containing Mr. Pickwick, Mr. Tupman, Mr. Snodgrass, and about half a dozen of the committee besides. Apparently a politician's kissing babies was then not quite so great a cliche. Dickens, Charles. "Pickwick Papers (1836-37). Il. Hablot Knight Browne. The Charles Dickens Edition. Boston: Ticknor & Fields, 1867. Dickens, Charles. "Pickwick Papers (1836-37). Il. Thomas Nast. The Household Edition. New York: Harper and Bros., 1873. Guiliano, Edward, and Philip Collins, eds. The Annotated Dickens. Vol. 1. New York: Clarkson N. Potter, 1986.